Do we stay at one place? Yes. It's more relaxing. It also saves the hassle of packing and moving on. So we radiate out each day. 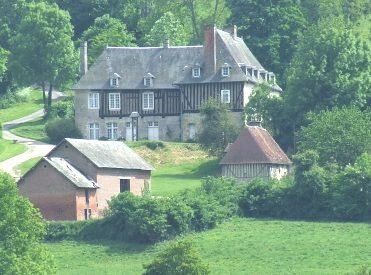 "Le haut de la Tuilerie"
is a fully renovated 17th century Norman "colombage-style" house standing on a hillside within 1,5 hectare of gardens called 'Le Tertre'. The grounds consist of a large orchard with a variety of fruit, a designed flower garden with lovely terraces, a natural pond and a vegetable garden. There are three double bedrooms. Two of these spacious bedrooms have their own separate exterior entrance at the lower level. They are situated on the east side of the house, overlooking the valley, catching the early morning sun. Each room has King size beds. The large bathroom, shared between these rooms, has a shower, two washbasins, bath, bidet and toilet. 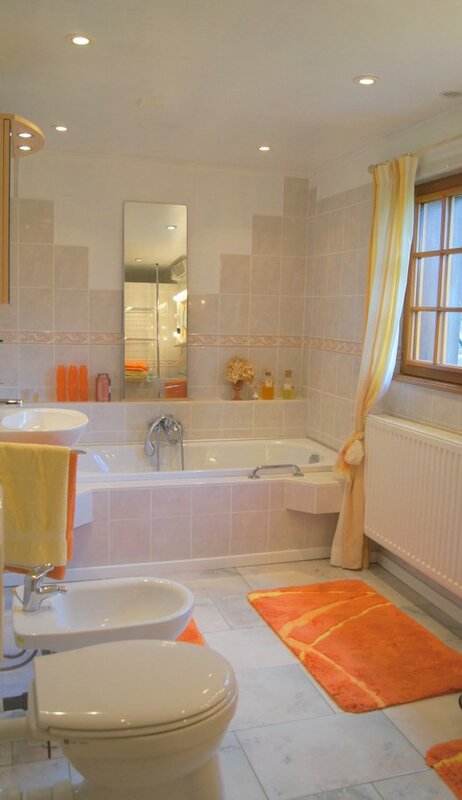 These two rooms share a beautifully appointed bathroom, shower, wash basin and toilet facilities. Within 2 miles of Camembert (cheese!). It is equally close to Mont Ormel - the Corridor of Death - and the Battle of the Falaise Gap. Mont Ormel was the 'Gap' through which the German 7th Army was escaping and was sealed by the Poles in August 1944. During that horrific 4 day battle 10,000 German soldiers perished. Your hosts Theo and Marion can help give you inside knowledge of the area. 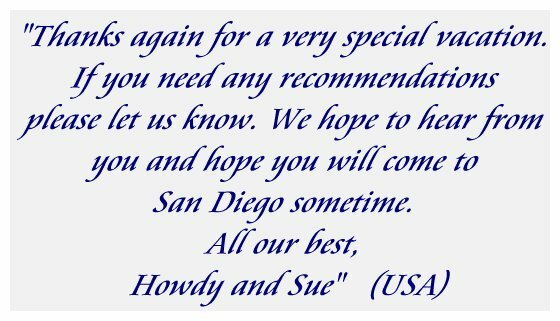 They have good humour and will help make your stay relaxing, informative and enjoyable. 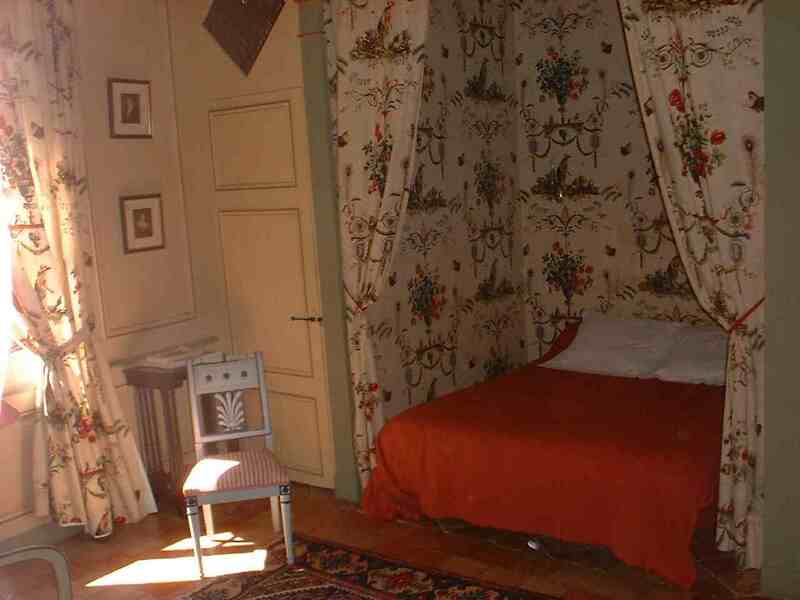 "Exmes" Maybe you would like to stay in a 17th century town house that has been occupied by the same family since 1888. 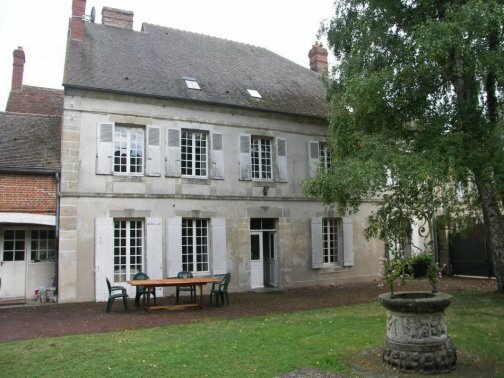 4Kms from the National Stud of Haras du Pin "the Versailles of Horses", the village of Exmes dominates the valley of the Dive river, offering exceptional views. 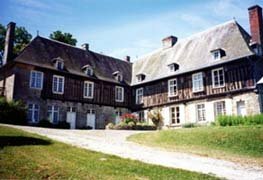 **************************** "Manoir de St Croix" As a Normandy Safaris client you will have the truly rare opportunity to stay in this authentic 16th century Manor House. 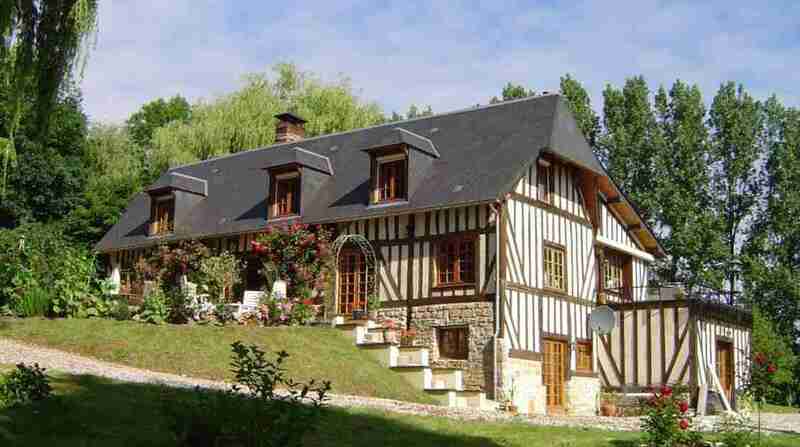 Situated on the valley side it commands very pretty views across the valley of the river Vie. Tastefully furnished in period decore, it offers 2 double rooms each with accompanying shower / bath, and toilet facilities. 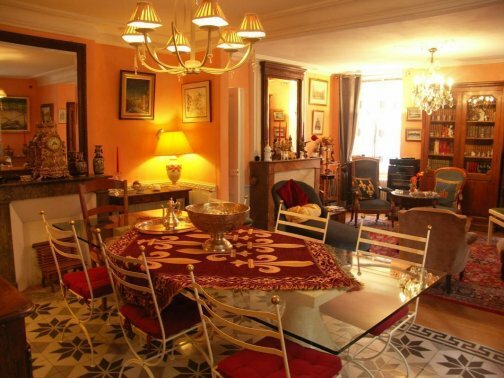 Jacques and Beatrice will be delighted to show you their enchanting home and will make your stay warm, welcoming and a fond memory. 'Mont Ormel' (3km) famous for the Battle of the Falaise Gap and the 'Corridor of Death', where the Poles plugged the escape route of the German retreat and effectively ensured the destruction of the German 7th Army. Ten thousand Germans perished in 4 days and roughly 50,000 surrendered thus bringing the Battle of Normandy to a close. 'Camembert' (4km) a tiny village world famous for its cheese. 'Tiger' Tank (10km). One of only two 'Tiger' Tanks remaining in France. 2) are already in France? 3) are in Southampton UK? Paris: Catch the train from Paris St Lazare to;- Lisieux and we will pick you up at the station. 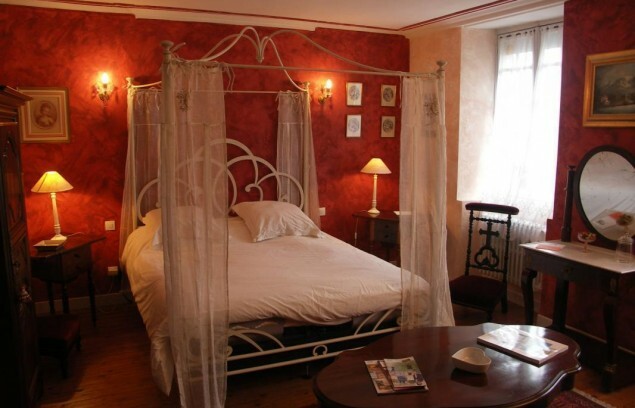 France: Catch a train to Lisieux, usually via Paris and we will pick you up at the station. Southampton: With cruise ships terminating at Southampton, crossing to Normandy is relatively easy: Take a taxi ride to Portsmouth and catch the ferry from Portsmouth to Caen/Ouistreham where we shall be waiting to pick you up. If you send an email we will try to make this transfer as easy as is possible for you. a) Go via the Chunnel to Paris and catch a train from Paris St Lazare to Lisieux. b) Go down to Portsmouth and catch the ferry from Portsmouth to Caen/Ouistreham where we shall be waiting to pick you up. Standard sea crossings to, and from, the U.K. take approx. 6 hours. 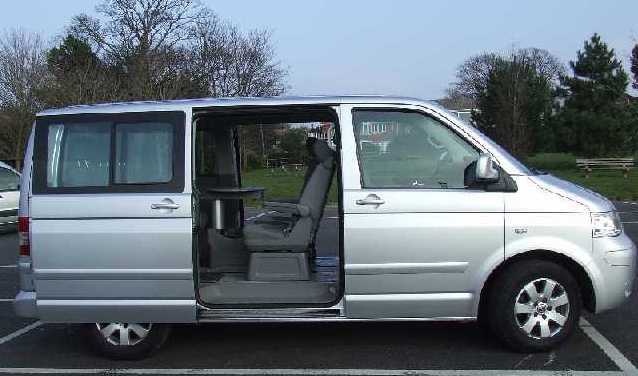 At the end of your tour we will deliver you back to the Station or Ferry Port for your onward journey. What kind of vehicle do we Tour in? When should we make a booking? Should we book early? Yes, book as early as you can. This is a small company and so there are only a limited number of places (6) available at any given time. Once you have decided on your holiday movements it would be prudent to reserve a place. It would be especially prudent to book if you are forming your own group. It would avoid losing the dates you want. We are quite willing to 'pencil you in' as it helps give us an idea of the forthcoming year's requirements. However, a reservation is only considered 'firm' on receipt of a deposit. What do we do if the dates we want aren't shown on the schedule? Ask for the dates you want. How much do I need? You require money for entrance fees to museums, gardens etc. (approx. 8 euros pp), lunches whether they are in a Bistro (approx. 15euros pp) or picnics (5 euros pp) and 2 evening meals taken in local Bistros/ Restaurants (approx. 20 euros pp). 150euros pp should cover you adequately. Money can always be obtained at an ATM. If you have special requirements e.g. Diet etc. etc., please inform us, so that we are able to help you. Remember:- It still costs nothing to Ask !